While traditional “Tuktuk” taxis have become synonymous with the cosmopolitan buzz of Thailand and can be found roaming the streets of every small town in the countryside, Pattaya makes a surprising exception to this national rule. Baht-buses (called so because decades ago, a Baht-bus ride would cost only one Baht) are modified, usually dark blue pick-up trucks with two rows of passenger seats in a covered overhead back cabin. 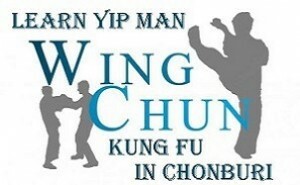 They’re the easiest and most convenient way of getting around in Pattaya and have served the community for decades. According to official statistics, more than 700 of these constantly honking dark blue tin monsters cruise the streets of Pattaya every day and play a major role in regular traffic congestions especially along Pattaya Beach Road near the Walking Street junction. Baht-buses can carry up to 10 or more passengers and usually drive around Pattaya in designated circuits, charging flat rates starting at 10 Baht for short-distance rides. So in order to use Baht-buses effectively, it makes sense for tourists to make themselves familiar with these regular Baht-bus routes. 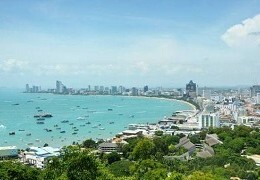 The main route goes all the way around Pattaya beach in an anti-clockwise direction – Pattaya Beach Road, South Pattaya Road, Pattaya Second Road, and all the way up to the Dolphin roundabout in North Pattaya. Alternative routes include: Pattaya-Naklua Road, North Pattaya Road, Central Pattaya Road and South Pattaya Road. 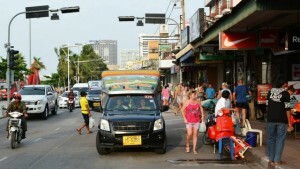 Baht-buses to Jomtien regularly depart from the intersection of South Pattaya Road (Pattaya Tai) and Pattaya Second Road, not far from the northern entrance to Walking Street. They also charge a flat rate of only 10 Baht; however, you’ll have to wait until enough passengers have boarded (usually at least 10). White Baht-buses on Sukhumvit Road also charge a flat rate of 10 baht, regardless of how far they take you. For example, from Naklua to the southern end of Jomtien, it’s still just 10 Baht a person. If you use Baht-buses on regular routes and don’t hire them as a taxi, drivers will usually charge a flat rate of 10 Baht for short-distance rides and 20-30 Baht for longer distances. 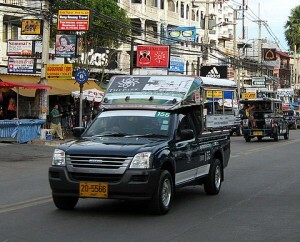 If your destination is along one of the main Baht-bus routes and you don’t require a “special taxi tour”, you should never ask the driver where he is going, or ask him to take you to a certain destination that may be on his designated route anyway; he would then interpret this as a “special route” (being hired as taxi) and charge you significantly more than the regular fare. Unless there’s no other alternative you’re also advised to avoid empty Baht-buses and such parked along the roadside. In order to avoid getting ripped off by Pattaya’s ill-reputed Baht-bus drivers – arguably among the least pleasant-natured guys you can meet in Thailand – you should just jump on the back of the Baht-bus and, if you’re not sure which direction he is going, simply wait and see where he’s taking you. Baht-bus drivers usually honk the horn and stop automatically when they spot a Farang waiting by the roadside; otherwise, a simple hand signal should do the job. Do not ask the driver “how much?” at this point. He would most likely take advantage of your lack of experience and charge you a price well above the regular fare. Needless to say that having a 10-Baht coin on you, or the appropriate banknote, will minimize chances of getting ripped off by receiving the wrong change. Note: If your destination is not along a designated Baht-bus route but requires a “special tour”, passengers will always have to agree on a price before. 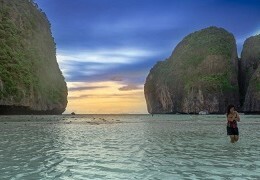 (For example, a chartered Baht-bus ride from South Pattaya to Jomtien shouldn’t cost you more than 200 Baht.) Fares are always negotiable and also depend on your bargaining skills. There are no fixed prices for special taxi tours. A final word about two-tier pricing and inflated Baht-bus rates for foreigners that many Baht-bus drivers unfortunately seem to find appropriate. The complaints by tourists and expats usually go as follows: Thais pay only (the regular) 10 Baht for short-distance rides while Farangs are often expected to pay 20 Baht or more for the same services. This “rip-off” is obviously not just unfair but also a sign of disrespect which authorities must eventually address. Baht-bus drivers that aren’t just “less friendly” than their fellow countrymen but will also try to overcharge and rip-off as many unaware tourists as possible, are hardly an effective publicity ploy to attract foreign visitors to Pattaya. But to look on the bright side: Despite the notorious problems with Pattaya’s main public transport system, the city’s ill-reputed Baht-buses are still the most popular, most convenient and cheapest way of getting around in Pattaya. At least in comparison with Phuket’s overpriced Tuktuks and taxi mafia, Baht-buses are a true blessing and – in spite of all the moaners and groaners – they’re just as popular as they were 20 or 30 years ago. If you’re bold enough to ride as a pillion passenger on a motorcycle in Pattaya’s chaotic traffic, then motorbike taxis may be a good, fast and cheap alternative to Baht-buses, especially when you’re on your own or heading for special destinations not located along regular Baht-bus routes. 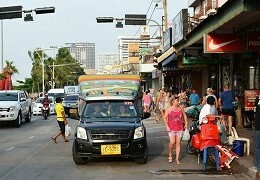 Motorcycle taxi stands can be found at virtually every street corner around Pattaya. Many drivers will shout mor-sai (Thai slang for “motorcycle”) and clap their hands in order to draw attention to their services. Vice versa, you can do the same – clap your hands and shout mor-sai as loud as you can as you approach a motorcycle taxi stand; they should then drive up to the spot where you’re standing and save you from walking the last metres (Thai style). Motorbike taxi drivers in Pattaya, other than their ill-reputed Baht-bus colleagues, are usually friendly and helpful younger guys. They can easily be recognized by their typical vests with the name of their taxi stand location printed on the back. Relatively speaking, most are “reliable” drivers with decent knowledge of the city, and often know shortcuts that Baht-buses would not take. Motorbike taxi rates for short-distance rides start at about 40 Baht. There is no general flat rate, though, so you should always negotiate and agree on a price before. Since 2008 Pattaya also has a number of air-conditioned Bangkok-style “taxi meters” that can be chartered at several downtown locations, e.g. outside The Avenue Mall and the Royal Garden Plaza mall, both on Pattaya Second Road in South Pattaya, or near the Dolphin Roundabout in North Pattaya. Note: As the metres are never turned on, you’ll always have to negotiate a fare before chartering a taxi to a certain destination. 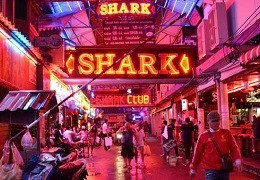 Prices start at 150 Baht; for example, a taxi ride from Central Pattaya to Jomtien should cost around 200 Baht. For those who have sufficient faith in their driving skills and enjoy being independent, a rented motorcycle is surely the most convenient way of getting around in Pattaya. The only official requirement is either a Thai or an international driving licence; although most motorbike rental shops won’t ask you for one. Motorbike rental shops can be found all over Pattaya, with hundreds of “motorcycle for rent” signs on the southern stretch of Pattaya Beach Road only. Many bars and guesthouses also rent out motorbikes to customers. Most models are half automatic “moped”-style bikes or fully automatic scooters with 80-125 ccm and electric starters. They can drive as fast as 100 km/h or more. Only a few are equipped with a clutch. The most common models these days are Honda Wave (half automatic), Honda Click, Yamaha Mio and Yamaha Fino (scooters). The average rental fee is usually 150-200 Baht per day, with discounts available when rented on a weekly or monthly basis. Bigger and more powerful bikes with up to more than 1000 cc, including original Harley Davidson models, are also available for rent. 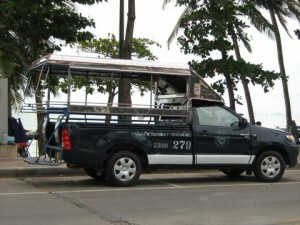 Most big bikes can be found along Pattaya Beach Road with a “for rent” sign around their steering wheel. In order to rent a motorbike, you will usually have to submit a copy of your passport. (Do not give away your original passport.) No further documents or driving licences are required usually. Insurance options may or may not be available; in case of an accident, however, you better expect to pay for any damage caused to the bike. Last but not least: Riding a motorcycle in Pattaya – with its notoriously congested streets and the careless driving habits not only of Baht-bus drivers but road users in general – can sometimes be pretty hazardous, particularly if you aren’t used to driving on the left. Even as an experienced motorcyclist, you should always be aware of the careless driving behaviour of other (possibly drunk) motorists whose reactions may be unpredictable. Of course, traffic rules do exist in Thailand, however, their interpretation in specific situations often depends on the motorists involved. That’s unfortunately the way it is. A STOP sign in Thailand certainly has the same meaning as anywhere else in the world; just don’t rely on everyone to get the message. Also, if a foreigner is involved in an accident with a Thai, the foreigner is usually made the scapegoat and required to pay for any damages, i.e. regardless of whether he was actually at fault or not. Sadly, “this is Thailand”. Please also note that not only the driver but also the pillion passenger is required to wear a helmet. While this regulation has existed for a long time but has been commonly ignored by traffic police, it is now increasingly being enforced within city limits – similar as rules regarding drunk driving, which has seen quite a bit of a “crackdown” in recent years and can surely no longer be recommended. If caught driving without a helmet, the official fine is 400 Baht and must be paid directly at the police station (bribing has become less of an option recently); penalties for drunk driving may include a night or two in jail and heavy fines. 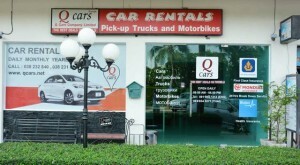 Along with dozens of local car rental companies, all major international car rental services are represented in Pattaya. Most rental cars are limousines like Honda, Toyota, or other Japanese auto models. Pseudo-Jeeps are also available for rent and can be found mainly along Pattaya Beach and Second Road where they block public parking space. The basic requirement for renting a car in Thailand is either an international or (preferably) a Thai driving licence, though most car hire companies should be satisfied if you can produce a national driving licence. 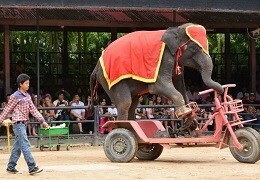 Please also bear in mind that driving in Thailand can occasionally be very hazardous, particularly if you’re not used to driving on the left. Same rules apply as when renting a motorcycle (see above). Selber fahren in Pattaya: Roller oder Mietwagen? I see so many Pattaya noobs getting ripped off by baht bus drivers… as did I when I got on my first baht bus and went up to the driver and asked how much a ride was. He told me 50 baht. The trick is to not even talk to the driver. If the baht bus doesn’t go in the direction you want, just hit the buzzer, get off and pay your 10 baht. As soon as words are exchanged with the driver, that is when trouble arises.